Aviva Yerba Mate - 99.9% Pure Leaf! Wow, Look at all the sticks! BTW, we don't actually sell this. You're Welcome! Is there any yerba in there? Aviva is one of a few companies that harvests, imports, and packages bulk mate from South America. We blend and package our mate under the Aviva brand name which is then distributed to wholesale accounts across the country or sold directly to consumers around the world. This control of the supply chain allows us to insure the highest quality standards during every step of production. 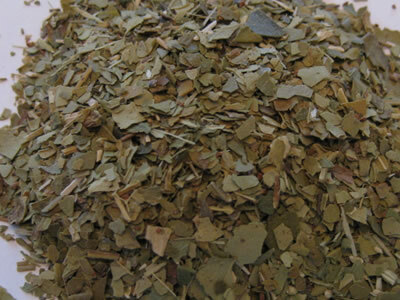 Additionally, our yerba is a deep green color, not a stale yellowish tone. 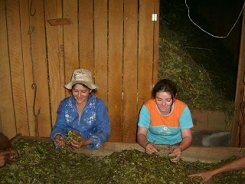 Like typical wine, yerba doesn't necessarily get better with age (although producers stuck with an oversupply that's been sitting in their warehouse for months or even years would like for you to think that!). We offer a diverse product line to accomodate the different drinking habits of our customers. We have loose mate as well as mate in tea bags. In addition to traditional flavor, we offer a variety of delicious blends. If you prefer to drink your mate the traditional way, we carry a broad array of ornamental gourds and bombillas. Because of increasing demand outside of South America, yerba mate ranchers have had to develop a means to meet larger production schedules. The result is not always the most environmentally-friendly way of bringing mate to the market. Typically, the natural forest is cut down and cleared to make room for nice neat rows of mate plants. This is similar to mass production methods here in the states (orange groves, grape vinyards, apple orchards, etc...) It is possible for this type of mate to be organic; however, pesticides are often initially used to control the ants and other bugs that prey on the young leaves. After the trees reach a certain height and age, natural defenses can usually take care of that threat. Organic growing methods are usually employed here. This process does not destroy the forest, but producers typically cut down and clear most of lower foliage. The tall canopy trees are left intact. Mate is then planted in easily cultivated rows beneath the canopy trees. This method has less of a negative impact on the environment than farm grown mate. Because the mate is grown in harmony with the natural land and its inhabitants, it is referred to as a "sustainable" means of production. Marketers of this type of mate often refer to their product as "shade grown" (or even "forest grown") because the canopy trees that were left intact actually do provide shade for the mate grove. With this production method, the forest is left intact. The land is not cleared and the earth not scraped. These trees have been nourished by nature not man. 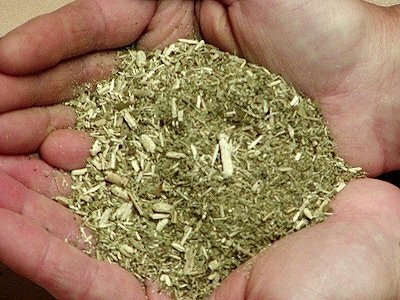 The leaves of the mate plants are thinner and possess a darker green color with a unique taste profile indicative of the natural elements found in the rainforest soil. Many consumers experience a bolder body and a smoother taste. The only clearing has been to provide roads and access into the rainforest. The rich habitat in the jungle is left intact.